MaMuse hosts an evening of singing together in circle, on the night before our first pilgrimage walk in Point Reyes National Seashore (see seasonal pilgrimages). The intention is to be together, weaving voices and connecting hearts. The menu of songs will include a range of simple rounds, four-part harmonies from Mamuse's original repertoire, and songs written by other fellow song carriers. We sing on themes of Joy, Gratitude and Grief—diving into the depths of life and lifting each other up in service to the well-being of all. Please join us to welcome in the waters of our emotions and sing to the waters that all eventually find their way to the ocean. Every voice is welcome and no prior singing experience is required. You are cordially invited to Chemistry, an afternoon and evening to amplify the heart. Come with love, come find love, come be loved, come be love. This is a community event woven together through the intention and heart of many local businesses & artisans. Please scroll through the event description to see all of the amazing booths, artists, and offerings. The Polish Ambassador (real name David Sugalski) is raising the bar for what it means to be a professionally touring musician. Sure, the electronic musician lays claim to producing the sweetest beats this side of the Milky Way Galaxy, but the world’s funkiest diplomat is also using his popularity to steer the millennial generation toward a nourishing and sustainable way of relating with art, community and the planet. From birthing the Permaculture Action Movement (a movement where the energy of show/festival goers is catalyzed into community action), to launching a Village Building Convergence in his hometown to creating a program where nutritious beverage options are available at music venues on a routed TPA tour, the ambassador is using his clout to make real, tangible change, and along the way inspiring hundreds of thousands. have been described as medicinal, hallucinatory, and haunting, with a trance like performance. Our collaboration with the Fula Brothers is coming to you in Bishop, California! Back By Popular Demand and celebrating the Release of their new album Prayers for Freedom! Join us in the Osmosis Meditation Garden for an unforgettable, heartwarming performance. All proceeds will benefit the Ceres Community Project. The evening begins with a cheese and wine reception on the newly remade front garden at Osmosis. An exquisite farm to table dinner will be prepared and served by the Ceres Community Project. CERES is a local non-profit teaching teens to cook while providing wholesome prepared food to families facing life-threatening illnesses. After dinner, guests will be ushered into the outdoor theater for the performance. 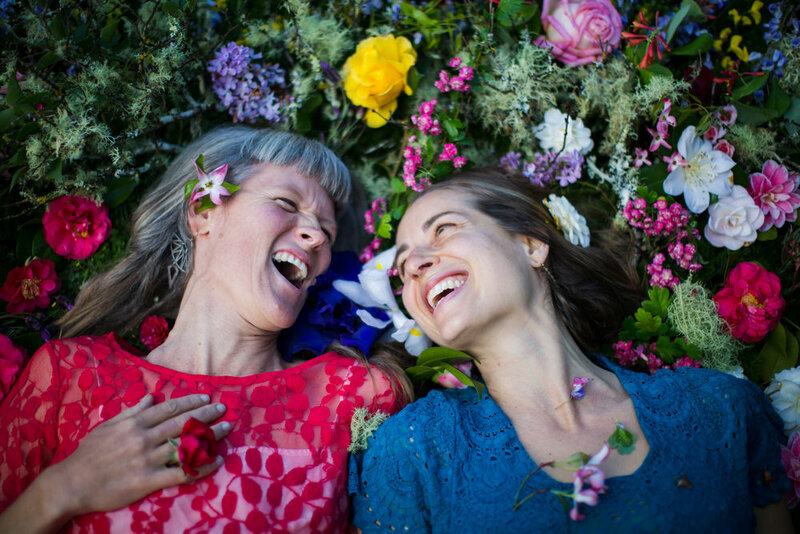 Wholeheartedly fed by the folk and gospel traditions, MaMuse (Sarah Nutting and Karisha Longaker) create uplifting music for the pure joy of it and to inspire the world into thriving. Interweaving brilliant and haunting harmony with lyrics born of honed emotional intelligence, MaMuse invokes a musical presence that inspires the opening of the heart. Playing a family of varied acoustic instruments including upright bass, guitar, mandolins, ukulele, and flutes, these two powerful women embody a love for all of life. The synergy that is created through this musical connection is palpable and truly moving to witness. With ten delicious years of co-creation and five full-length albums under their belts, MaMuse keeps their hearts tuned to the creation of music for the health of ALL BEINGS. An evening of story and song about water. MaMuse is Happy to announce that we will be headlining California World Fest Thursday July 12th with Fula Brothers in a collaboration we call "FULA MUSE"!! This will be a FULL set of danceable, heartfelt, uplifting, soulful, magical, juicy tunes to set the tone for this weekend . Get your camp spots early and come join us.. We will also be offering a community sing workshop and a two other "MaMuse" sets of music over the weekend... come enjoy this one wild and precious life with us. Lets get singing! Join us JULY 5-8 for 3 days and 3 nights on the beautiful land that carries River's Bend Retreat Center! The Work that Reconnects and Community Singing are tools to support us in cultivating vitality in the midst of all that it is to live in these times. Let us come together to sure up our readiness to thrive, not just for ourselves, but for our planetary family as a whole. We are honored to be invited back to sing in honor of Kate Wolf and the spirit of keeping music alive and well on planet Earth. We will be sharing both "sets" of music as well as engaging in workshop environments where all can sing and mutually lift up the collective spirit. Beautifully diverse lineup this year. Come join us. Set times TBA. FulaMuse is a double dose of heart poured over rhythms to uplift the body and soul - the union of two bands who nourish and rouse the collective spirit. MaMuse invokes a musical presence that inspires the opening of the heart. 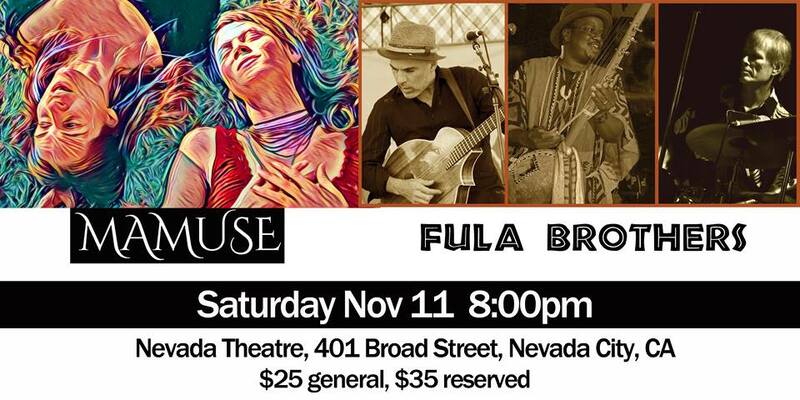 Fula Brothers create an ecstatic groove-based dialogue which the heart – and the feet – cannot resist. The rich diversity between them and their shared love to buoy the spirit creates collaborative magic. 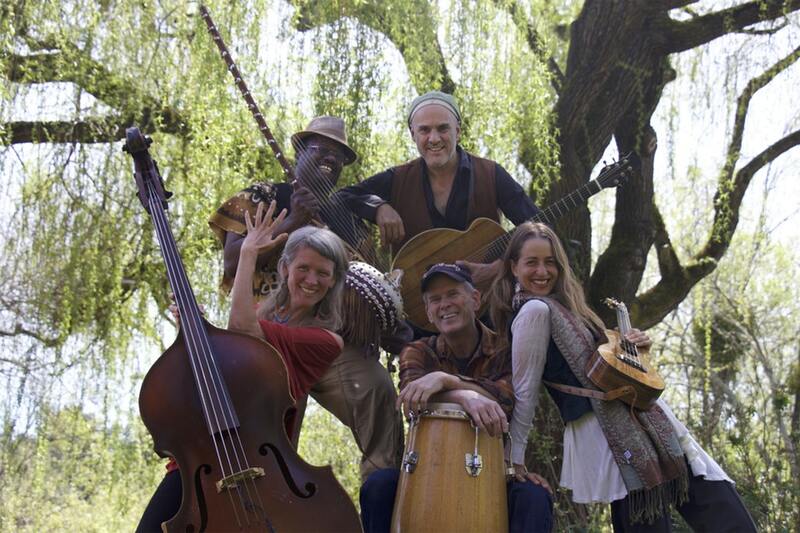 Songbird singers, West African hunters harp, fingerstyle guitar, drums, vocals, bass, ukulele - all part of the bounty. Boatloads of improvisation, a full heart, and always an ecstatic community of dancers. Revival for your Sunday evening! Come renew your your relationship to connection, community, vitality, and resilience Sunday June 10th in Bellingham Wa. Connect, renew re-juice, revive! Prayers for Freedom is alive and needs to be celebrated! Come support us as we support your continued upliftment! "PRAYERS FOR FREEDOM"! Here we come! Come help us release our newest creation into the world. This is our 5th Full Length Album, and our best yet. MaMuse is more than excited to share our new album PRAYERS FOR FREEDOM with PORTLAND! We are also doing back flips because we get to share this very special evening and this stage with one of our favorite people on planet Earth, Claudia Cuentes!! Claudia is a song catcher originally from Peru now gracing Portland with her brilliant spirit and powerful voice. Her songs are born form an ancient now, calling us both forward and backward in time until we find ourselves dancing happily in the present. She has been likened to Mercedez Sosa, for she the deep resilient, uplifting, spirit she brings into her voice and the world. Be prepared to be moved! We're coming north to share our newborn CD, PRAYERS FOR FREEDOM!!!! YES! We are delighted to return to Ashland Oregon in to celebrate the birth of our 5th Full Length album, "Prayers for Freedom"... An evening of depth, enchantment, community and connection through song. PRAYERS FOR FREEDOM!!! For this special CD release concert, our dear friend Claudia Cuentas, Magical Peruvian songstress extraordinaire, will open the night with a presence and power not to be missed. Enjoy good music, good food, and good company to support the flourishing of Gaia Girls Passages! **Low price tickets are limited, so register early! Gaia Girls Passages provides school year circles and summer camps for girls ages 7-18 in the Bay Area of California. Our vibrant inter-generational community supports girls through the changes from childhood into adolescence through nature connection, social and emotional tools, village building, and a supported Rite of Passage. All funds collected will be in support of providing a healthy alternative for girls who are facing the negative pressures of a world out of balance and will support the next generation of female leaders.